Ideally located between two of the most known villages in the Aljujarras with a private drive leading directly to the house, benefitting from easy walking access to the shops, bars and restaurants of either village and numerous walks in every direction. The house was built in the traditional way with stone and chestnut beams and is double-glazed throughout. At certain times of the year the shepherd brings his sheep to the meadow next door and you can enjoy the music of more than a hundred bells as they happily graze the varied grasses and flowers. After working for 25 years as a school photographer I finally managed to give up the rat race and follow my passion for flamenco and travelling with horses. We renovated a very rustic ruin in the gorge below Capileira, taking everything by mule, and spend most of the time down there with our horses, wild boar and Ibex, where we're kept busy in our organic vegetable garden and orchard, when we're not away on trek. The Poqueira valley and it's three villages have everything you need without having to resort to driving a car everywhere, plenty of shops/cafes/bars/restaurants within easy walking distance but sufficiently far away so as not to spoil the peace and quiet of the cortijo and it's garden. We use the cortijo for a few months each year so there are family photos and personal possessions in the house, but also, a well equipped kitchen and large selection of books to be enjoyed by visitors. Wonderful garden and orchard with mountain and valley views all around, acequia stream running alongside and immediate access to local paths. River is accessed by various footpaths, water remains cold even in the hottest summers but can make for refreshing fun! Notes on accommodation: Very comfortable living all on one floor with double-glazing throughout and plenty of windows. Because the owners use the property regularly there are many personal items in the house such as family photos, CD's, books, maps, sewing kit etc... which can be enjoyed by visitors during their stay Outside: small barbecue, hammocks, benches and several table and chair sets in various parts of garden (sun or shade) Cleaning / Towels / Linen / Bathroom towels and linen are included (please bring your own towels for beach or garden use), the house is cleaned prior to arrival. Small torch recommended for night-time walking between villages. We had a fabulous 11 nights at Nadia and Marco’s cortijo in Bubión. We loved the location which was halfway between the Alpujarra villages of Capileira and Bubión with a good sendera (footpath) in between. We did some nice long walks on the GR7 either from the cottage or by catching the bus in one of the villages, including the ancient mule paths near Busquístar/Pitres and the abandoned village of Cebadilla. We caught the early morning bus for a two-day stay in Granada which was very convenient. We also got the national park bus from Capileira to the base of Mulhacen (mainland Spain’s highest point) - it’s five hours up and down and you need warm clothing at the top. Nadia was on hand to provide lots of useful information and we liked eating our meals in the beautiful garden, listening to the sheep bells with her friendly cats for company. The house was well equipped and having a washing machine was very useful after such long walks. Nearby places include Órgiva and Pampaneira which had lots of places to eat although Capileira was our favourite village as it was less tourist driven. Would recommend a stay here to couples or families and a car is essential to get from Malaga airport. Thank you Nadia and Marco! We have just returned from 2 weeks in this lovely country home. We had a wonderful time. 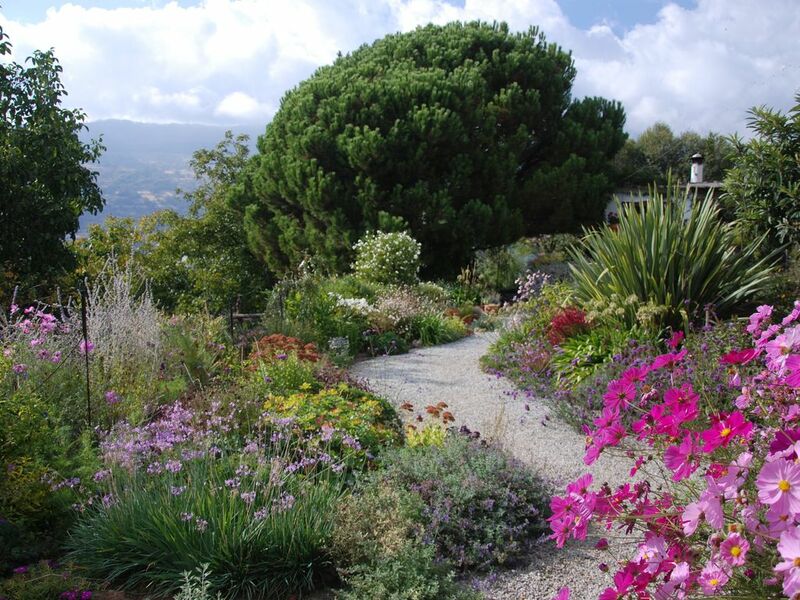 The area is peaceful and the house is set in beautiful gardens with fantastic mountain views. We went on lovely mountain walks. There are not too many restaurants but enough to choose from. We had some amazing meals, always with excellent service. The house itself is a little gem. We would definitely visit again but perhaps in September when it is a little cooler. Beautiful house which had everything we needed. Gardens are stunning, even saw a red squirrel whilst drinking coffee on the patio. Great views across the valley. Ideal location for circular walks. We had a fantastic stay at Nadias cortijo. The house itself is beautifully decorated inside, full of interesting objects and all the things you need. The garden is a real pleasure with a wealth of flowers and wildlife, and so many places to sit and drink coffee/wine/eat and enjoy the quiet stunning mountain location. Both Nadia and Marco were great hosts: helpful and friendly when we needed but leaving us plenty of space and privacy. For anyone wanting to experience the Alpujarras this is the ideal place to stay. You are just 15 minutes easy walk between two typical villages with great shops, places to eat and plenty of character. However the house itself is in a rural quiet location with unspoilt views of the mountains and Poquiera valley. There are opportunities for amazing walks and drives throughout. We had a perfect time and would recommend to all. Quiet and decoreated with love. The house is located at real quiet place with a wonderful garden and real nice decorated house. Nadia and Marco did put a lot of effort and love in their house. We loved to stay here, and we will come back for sure! One and a quarter hours drive to the beach, approximately the same to the Alhambra Palace in Granada (pre-booking recommended, well ahead of time) or an hour and a half to the Sierra Nevada ski resort for a winter's day outing. Malaga airport is two - two and a half hours drive, Granada one and a half and a car-hire is recommended because although there are three buses a day to Bubion there are none at night for airport arrivals. 500 metres to Bubion centre and 800 metres to Capileira village, 30 mins drive to the market town of Orgiva. Emergency ward 15 minutes drive. Within a short walk in either direction you can find everything you need in the way of cafes/bars/restaurants. Shops: bakers, small supermarkets, butchers, chemist, doctor, bank and hardware stores, fish van visits 3 times a week and fresh vegetable lorries and small market stalls set up once a week. Horse-riding by the hour, day or week provided by two stables (both owners are friends of ours) excellent healthy, happy horses and both speak English and Spanish. The swimming pool at the campsite in the next valley (15 mins drive) allows non-residents to pay for the day, shady garden, terrace cafe/bar, at some point in the not-too -distant future Capileira and Bubion plan to open their public pools but probably only during July and August - which is normal for Spanish villages. Local mountain-biking guides, or guides for high sierra walks. Flamenco or painting courses available at certain times of year in Capileira. Booking Notes: To confirm a reservation a 25% deposit by bank transfer will be required, the remainder to be paid 8 weeks in advance or on booking if within 8 weeks of commencement date. 100% refund for cancellations made up to 12 weeks before commencement date of holiday, 50% refund for cancellations made between 12 and 8 weeks, and no refund for cancellations made within 8 weeks of start date of holiday. It is advisable to purchase an insurance policy. Changeover Day: During changeover days when house is reserved for new arrivals departure needs to be by 10.00am and arrivals not before 4.00pm to allow for cleaning. At other times flexible. Notes on prices: During the winter months there will be a supplement of 25 euros per week or 5 euros per night for firewood/heating costs which are expensive in Spain.